The MV Steve Scalise was built at the Verret Shipyard in Plaquemine, Louisiana to a design by the shipyard. Delivered in early 2011, the 85 by 30-foot towboat is a little longer than some of this horsepower class. With a molded depth of 10.5-feet the hull has tankage for 30,000 gallons of fuel, 16,800 gallons of water and 450 gallons of lube oil. A pair of EPA Tier 2 compliant Cummins K38-M main engines turn four-blade 74 by 56-inch four blade stainless propellers from Sound Propeller through Rentjes Model 562 gears with 6:1 reduction. The MV Jerry “Dog” McLain was also delivered this year. 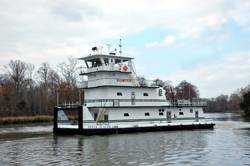 This towboat, from by the Raymond and Associates yard in Bayou LaBatre, Alabama, was also built to the shipyard's own design. At 76-feet the “Dog” is shorter than the Verret boat by nine feet. However with a 35-foot beam she has five-feet more width. The slightly deeper, 11-foot molded, hull carries 31-300 gallons of fuel, 10,300 gallons of water and 587-gallons of lube oil. The engine room has the same power set with two Cummins K38 main engines. The difference is in the TwinDisc MG540 gears with 7:1 rations swinging Kahlenberg Stainless Steel four-blade 76 by 63-inch wheels. Both vessels have Patterson deck winches, Hiller Fire Suppression systems and a pair of Cummins 6BT5.9-powered 85 kW Stanford generators. The Scalise is fitted with a Blue Box Recording System and the Jerry “Dog” Mclain has Simplex Shaft Seals and a Sims Motion Detector. The Scalise has accommodation eight people while the “Dog” has bunks for seven. Assigned to inland towing, both vessels are inspected under the Un-Inspected Towing Vessel Program (UTV) by the US Coast Guard.